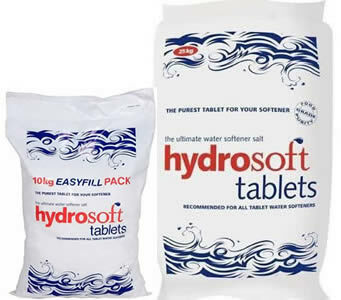 We deliver Hydrosoft tablet. We recommend the use of tablet salt in water softeners - they are slightly more economical, there is less likelihood of bridging and the unit may be filled without the risk of overflowing. There are two different sizes of bag; the 25Kg or the 10Kg with a useful handle to help with carrying. We deliver to those of our customers who live in the Essex, Hertfordshire, South Cambridgeshire and West Kent area. Please phone, fax or email us to place an order for salt for your water softener and we will deliver as soon as possible (see Contact Us).